Domestic and international mobile carriers have something to worry about Facebook’s plan to build an app it likes to call “Phone.” From every indication, this will be a major challenge to existing mobile services offered in the global market. The revelation of the plan was accidental, or so it seemed. It came from a leaked information that indicates Facebook is now in the stage of testing the app, which is reportedly designed as a native dialer that many see as being intended to replace the existing dialers in mobile phones, although that may look very unlikely. Probably, some of you might have guessed before that it would come down to this, what with the recent efforts at Facebook to bolsters its communications offering. From social media to mobile messaging (when it acquired WhatsApp), now it is shifting to voice communication service. As a native dialer for Android handsets only, the Phone app will display information about the caller, for instance. Facebook did not deny that it is indeed testing the service following reports of a screenshot that confirms the rumor. However, it is highly unlikely that an iOS version of the app will be ever released. Apple has been known to be unreceptive to third-party developers. Let’s take a look back at how Facebook could have come up with this kind of app. Beginning in 2013, the social networking giant has been enabling users to make voice calls through Facebook Messenger and video calls since 2011. But the services are not without limitations. Only those users on either end of the communication could have access to the service. Meanwhile, users could only perform voice calls over a mobile data network or WiFi connection. With Facebook’s Phone app as a native dialer application, the social networking site would still have to coordinate with a carrier for its voice network service. 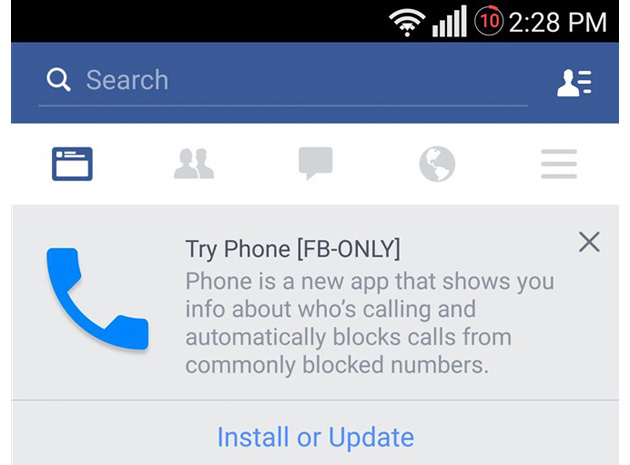 The app is also reportedly going to filter calls not only between Facebook users but also calls made to your mobile. Although this app is already put to the testing benchmark, there is no clear demand in the market for it at present. So it would be safe to expect that the app might be released in later than sooner. The signs all point to the fact that Facebook is itching to make its way into your every way of communication, even to the extent of challenging the current practices when it comes to voice communication.